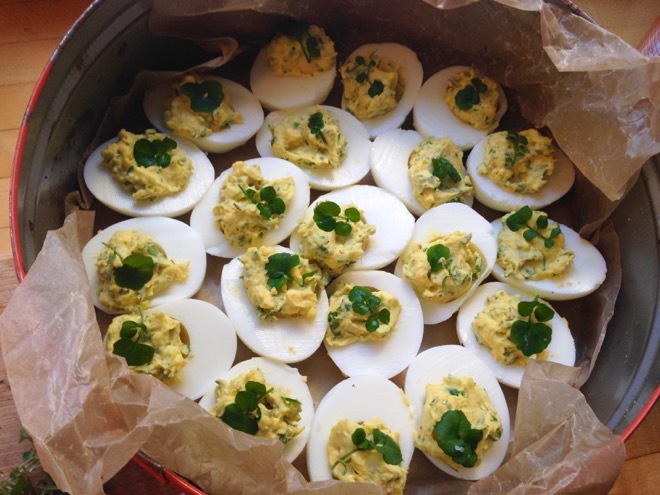 A recent last minute request for deviled eggs, which I usually make with lots of herbs, presented yet another opportunity to NOT go to the store. I stepped out my back door and found lots of pop weed, aka Hairy Bittercress, a few puny parsley sprigs, a little marjoram and thyme. 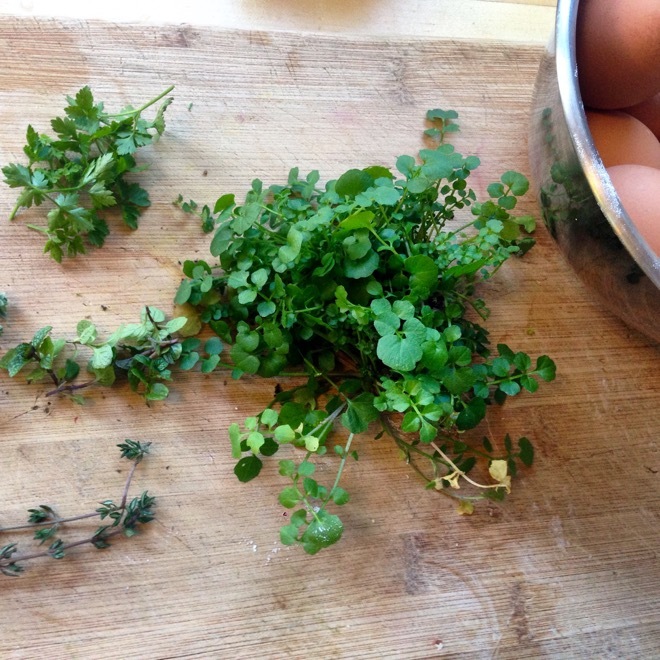 I wrote about Hairy Bittercress in my very first blog post and it remains noteworthy. Loathed by farmers and many gardeners it is a quickly spreading pest that is best removed before it goes to seed and its seeds “pop” and explode everywhere. However, in January when you need something fresh, green and spicy to add to salads, soups, or deviled eggs, it is a welcome weed. Step outside and look around the sidewalk crevices or little muddy patches along a garden path and you will likely find it, if you live in a climate that is temperate and damp in the winter. 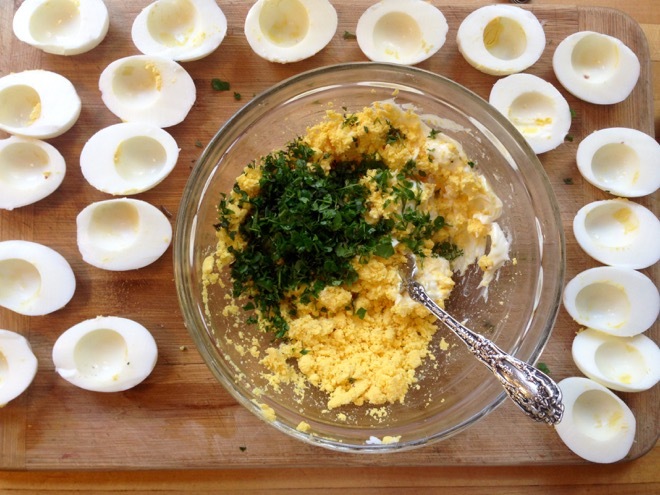 Most any other spicy/peppery green or herb will work beautifully in rich deviled eggs. Finely chop arugula, mint, watercress. . . .and stir into the yolk mixture. 2 teaspoons chopped fresh parsley, marjoram, cilantro, etc. Peel eggs and slice eggs in half lengthwise. Scoop out yolks and put into a bowl. Mash with a fork and add the remainder of the ingredients until well mixed. Adjust seasoning to your liking. Fill mixture back into egg halves with a teaspoon. Decorate with a bit of the chopped herbs if you like. don’t forget to peel the eggs! If you have any advice for how to easily peel just boiled eggs, please post. It seems I spend a long time trying to get the peel off. Ha! Yes, please peel the eggs. Alas when the eggs are fresh (which mine usually are) they are always hard to peel. I wish I had a good trick for those. Older, grocery store eggs, almost always peel beautifully. – Make sure your eggs are at room temperature. This will reduce cracking when submerging them in boiling water. – Bring a pot of water to boil over high heat. – Slowly lower the eggs into the boiling water. – When boiling resumes, set timer for 15 min. and reduce heat to keep at a low boil. – When timer goes off, drain eggs and submerge in ice bath until chilled, then peel. Interesting! Will have to try. Thanks Kathleen. Let me know if it works for you…with a couple of exceptions I’ve had terrific luck with it. Amazing. I’ve always been frustrated by pop weed . . . but we just took a walk and ate some bittercress and it is wonderful! Thanks for this revelation. I’m so glad you can appreciate it a bit now! I had no idea that was edible. I have a field of it outside my classroom window!